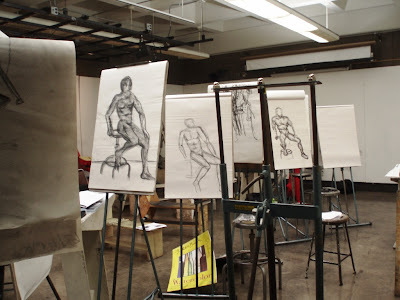 Monday afternoon in room 400, the life drawing studio in Jack Arends Hall. Time to pose. Time to draw. Time to be drawn. I spent a few more minutes scrutinizing the student's work before they returned, the instructor following with some cast, plastic human skulls in her hands. She told me to take a 15 minute break while the students worked on drawing the skulls. I spent the break watching them work, something I don't often get to do. Some of them were quite good- it was fascinating to watch their drawings go from a toned canvas with some charcoal smears on it to some quite interesting views of skulls. After drawing the plastic skulls, it was time for the students to draw my skull. I took the posing platform (still robed! 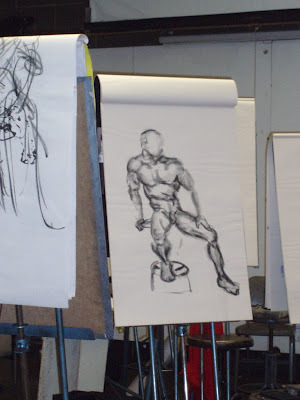 ), took a seated pose, and spent the last 50 minutes of class having my visage put to paper by the class. The instructor left the skulls flanking me on either side of the posing platform on draped stools to remind the student about the structure under my flesh. I had a brief chuckle before we began- I felt like I was part of some odd, voodoo ritual, seated like a shaman between the (reproduction) skulls of the dead. At the end of class the instructor announced we would probably repeat the same class format on Wednesday- warm ups (minus skull drawings) followed by more portrait drawing. I'll let you know how it goes.